Looking for professional siding contractor in Deerfield IL? Today’s Deerfield homeowner has more good choices than ever before when it come to selecting a siding option for their home. Fiber cement, vinyl, wood, metal or aluminum can all be terrific exterior siding choices. Of these options, the most popular choice of Deerfield homeowners is James Hardie fiber-cement siding. Fiber cement siding is durable and requires almost no ongoing maintenance. James Hardie siding is available in Deerfield in various styles, and colors. You can get models with finishes that mimic traditional wood lap siding or they can look modern and bold. Another bonus, is that fiber cement siding, like James Hardie, has the highest re-sale of any home improvement project you can do. The picture above is of a home in Deerfield where Siding & Windows Group installed stunning James Hardie fiber cement siding and replacement windows by Marvin windows. Both products are superior quality products that require little maintenance and are excellent value for money. 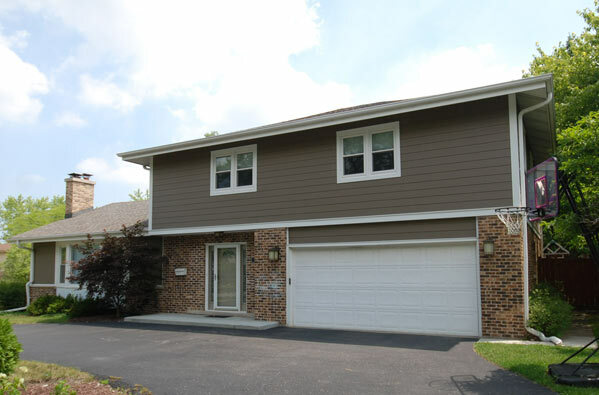 Browse this and other siding projects in Deerfield. If you need a good Deerfield siding contractor to repair or replace your home’s exterior, Siding & Windows Group has been trusted by hundreds of Deerfield and surrounding area homeowners, and has proudly served Deerfield with top-quality products, professional craftsmanship and outstanding customer service. Looking for more from your siding contractor Deerfield? Siding & Windows Group doesn’t just stop at siding. We also offer energy efficient replacement windows and are recognized as a leader in the remodeling industry for originality, innovation, and architectural integrity for exterior design. As the leading siding contractor in Deerfield, homeowners praise our work, and enjoy the amazing results: a beautiful looking home, a lifetime siding warranty, and our ten-year labor warranty. We are proud of the many awards we’ve won that are a testimony of the commitment we take for each and every project we undertake. We are the premier Deerfield Siding Contractor! Click here to receive a free estimate for your Deerfield siding project from Siding & Widows Group! Click here to read more customer testimonials in Deerfield and other Chicagoland areas.